Chimenea: Largest range of Cast iron Chimeneas available online, aka chimnea chiminea, brazier, Fire Pit, barbeque and accessories for the UK. Live help available on our site Mon-Fri 9:30-5:30. Free delivery : mainland UK deliveries on all chimineas. Massive savings on Cast Iron Garden furniture & patio sets. Perfect companions for outdoor cooking, each of the designs can be placed on the coals of your fire to cook a variety of meals. 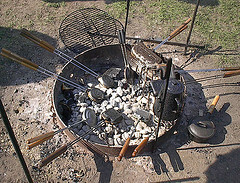 The pie iron designs, below, are specifically made for open fire use. They feature extra long handles to keep the user a safe distance from the fire and are secured to the cast iron pie moulds with metal pins to insure that the rods do not disconnect from the cooker during use. 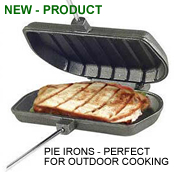 The classic, best selling Pie Iron loved by camp cookers throughout North America. The following designs are intended specifically for use on a BBQ grill, a gas stove top or two-burner camp stove. They feature the same quality cast iron moulds, but have shorter handles for ease of use on a stove.